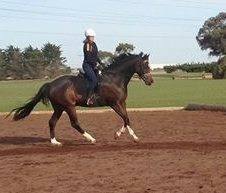 Early in 2013 I was teaching at West Coast Adult Riders Club and Simone Webb came into my lesson on a truly beautiful new horse. This lovely animal then proceeded to be very naughty and succeeded in removing Simone and took himself on a jolly jaunt around the grounds. When working with Simone at the end of the lesson two things became apparent. The first is how much she adored Anton, the second was how terribly scared she was. Since that day I’ve had the pleasure of coaching Simone and Anton nearly every week. 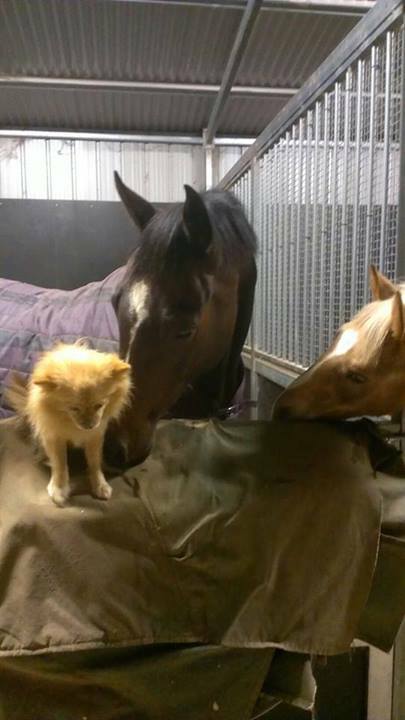 During that time I’ve seen a real partnership start to bloom and both horse and rider grow in confidence and trust. As a coach the journey has been incredibly satisfying. Not just for the successes Simone and Anton have shared in and out of the competition arena but for how I feel I’ve learnt to be a better coach to nervous riders and been able to create better products to support them. This blog isn’t short however I think it’s terribly important for people to read it in its entirety as Simone bravely shares her own experiences. Being scared of doing something you love, something you do for enjoyment isn’t fun. It’s also not something everyone is prepared to either admit to or to share. Thank you Simone for taking the time to tell your story. I know it’s going to resonate with many, many people and thank you for allowing me to be part of your journey. I’m so terribly proud of you both and pleased to also be able to call you my friend. Fiona Dearing – Remote Coach. I used to quite often find myself thinking back to when I actually lost my confidence. I know I was always nervous when riding at adult riding club, I was always nervous at competitions, I was always nervous when having a lesson, but I thought that was just normal. I suppose when the horse you are riding has been around the traps they don’t tend to over react to your emotions and it lulls you into a false sense of security when really you are internally combusting. Fast forward 18 months and I realised the horse I was currently riding was not going to get me where I wanted to go and frustration levels had peaked so decisions had to be made. I had goals and aspirations of being a magnificent dressage and show rider. So we sold the grumpy chestnut quarter horse, sold the pony that the kids weren’t riding, sold the old ute that wasn’t getting used, emptied my rainy day savings and came up with a sum of money that I was sure would purchase me a really nice horse, and it did. His breeding is royalty, to look at him takes your breathe away and to watch him move makes you gasp. I bought him home, showed him off to family and friends and couldn’t wait to start riding and get underway with my dreams. Well, he was a lot bigger then my last horse standing at 16.2hh and the first time I got on at home, by myself, it was an OMG moment, his neck went on forever and it was a long way down…… not to worry though, off we go at walk, so far, so good, next trot, holy c! *p, what the heck was that, his movement was huge and it gave me such a fright that I immediately came back to walk! He had been home with us for a couple of months, we had pottered around in the paddock, I had brushed him, lunged him, ridden him and tried to cuddle him even though he didn’t like to be touched all that much. I thought that strange but didn’t read too much into it. I told myself it was time to head out to riding club, my riding needed improving and he had had enough time to settle in. The second Sunday of the month came around, I was more nervous then normal, to the point where I didn’t really want to go, but I kept telling myself that I had to do this. He was difficult to get on the float but we persevered and eventually we were on our way. A lovely summers day, I mount, ride over to the arena, introduce myself, meet the other three riders in the lesson, general chit chat, receive lovely comments about my new boy and the lesson starts. I really don’t remember what transpired from there only the moment where Anton bolts out of the arena, I can hear the instructor yelling “turn him”, “turn him” somehow I did, he stops, I stay on and return to the lesson. Frozen, still mounted we stood in the middle of the arena whilst everyone else carried on with the lesson, then without warning, Anton spun around, I lost my balance, he took off and I hit the ground, hard! Anton bolted to the other side of Elcho Park, I paused on the ground took stock of what hurt and slowly got up, dusted myself off and waited as my husband retrieved my horse for me. Scratched and bruised from the scoria, again we stood in the middle of the arena while everyone else finished their lesson. I don’t know if I was more embarrassed or ashamed but at that point in time I was crushed, humiliated and felt so helpless all the “what ifs” came flooding in and words can not convey the emotion I was feeling. Then, the instructor takes me into the sand arena, makes me mount, we walk around and then she makes me trot, far out!! I just want to get off and hide under a rock somewhere. Discussions about “how is he on the ground” transpire with my response being good, and genuinely I thought he was good. But he wasn’t. So after a couple of weeks had passed and I had purchased myself a protective riding vest I started having private lessons, I was not at ease in the lessons and I felt physically sick each time I booked the next lesson, but I kept booking them because I love horses, I love riding and I couldn’t stand not being able to do it because of fear and after each lesson I was feeling a little better, but I could not control my nerves as hard as I tried. Rescue Remedy was recommended to me, so I purchased in bulk, the recommend dose was a couple of drops, well I was necking it by the eye dropper full, I would take some when I went out to the stable, another dropper as I was loading the float, another as I got in the car, another before I mounted, I was assured however that I could not overdose, luckily. It sort of helped but I didn’t feel it was a solution. During this time I also started paying more attention to Anton’s behaviour and demeanour, he was quite a nervous horse, any change in his environment and his heart would beat so hard, he would snort and his whole body would tense, he was oblivious to the people around him and could not be calmed, while he was in this frame of mind he was quite dangerous as his flight instinct was extremely high, what a pair we made! I sent emails to herbalists, spoke to feed manufacturers to try to pinpoint what was causing all the issues, I looked into his past, I did not feel he had been mistreated but knowledge is power as they say. I discovered the spinning and bolting was not new, more accomplished riders than I had been dumped as a result of his strong flight reaction when he became unsure about a situation, a trick he had learnt which usually resulted in him getting out of work. 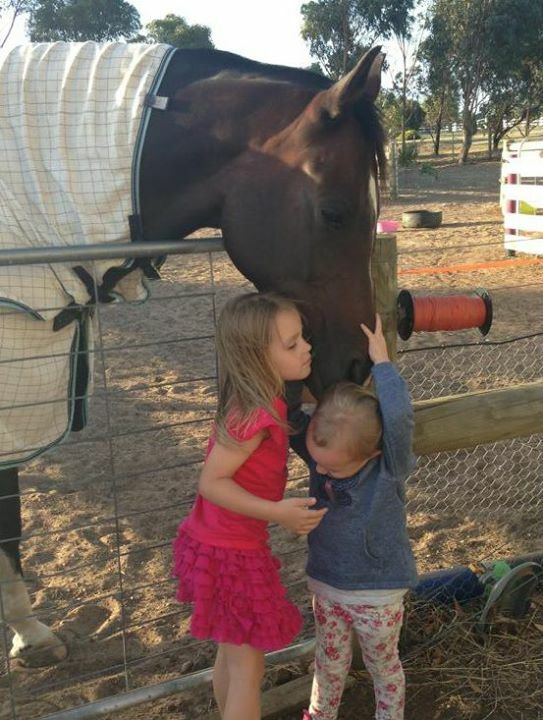 He still got fed and put back in the paddock, so life was grand. This discovery did not help my confidence! How was I going to work through this? I then managed to contact his breeder, which I look back on as a significant moment. She spoke of a beautiful, quiet, gentle horse that she loved desperately, bred from her magnificent mare that passed on a temperament you could only dream of and a stallion where only the best would do. So what had happened to him since leaving her care as a two year old and him coming to me at nine, at the end of the day it was irrelevant, his was mine and I needed to get things right. We started with the dentist, he needed some work but nothing that should have caused behavioural issues, next our lovely equine masseuse came out, she found some problems in his back from a previous injury and it took several sessions before Anton would relax enough to let her work her magic. Next was the saddle fitter, we made some major adjustments to my saddle so that it actually fit him properly. While this was going on the herbalist had Anton on a program that involved several herbs and tonics which was to repair and strengthen his nervous system and calm an issue in the hind gut. 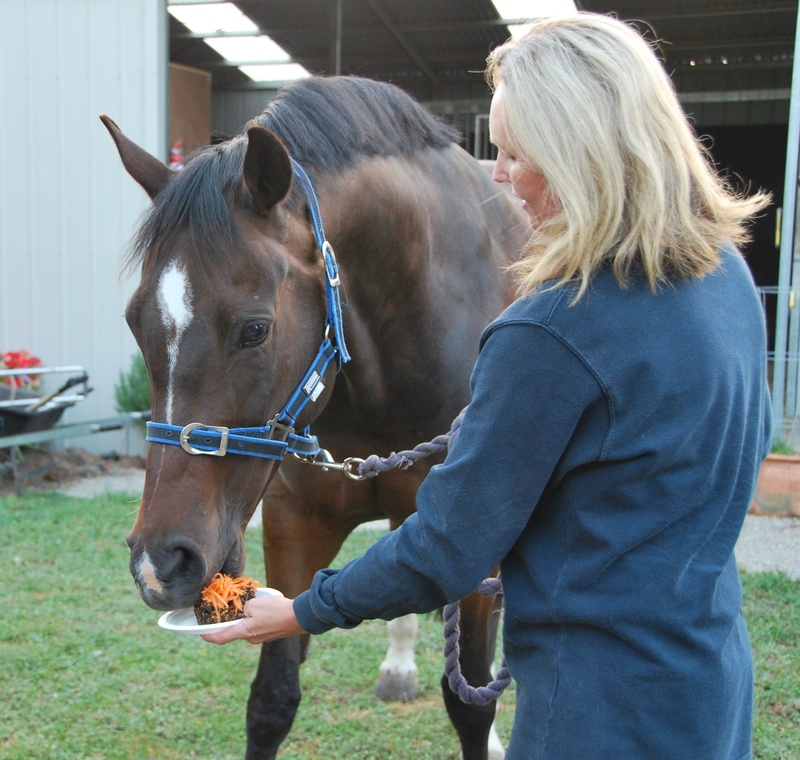 We had discovered that Anton had previously been diagnosed with ulcers and a life of moving from one training stable to the next had made him quite insecure. Being a mature age professional working in a high pressure environment I could not understand why it was taking me so long to “get over this” surely a few more rides under my belt and it should all be OK, but I wasn’t getting better I was getting worse. I was dreaming every night of Anton bolting and me falling off, unconsciously I was sabotaging myself. I decided I needed to break things down to smaller segments work out what was good, what was bad, what had been achieved and what was a work in progress. There was a lot more on the bad list than the good which was sad but true. We tackled his ground manners first, no more pushing and rushing when I was leading him, we did a lot of walking around the paddock, stopping, walking, turning, trotting, when riding club came around we went but I didn’t ride, instead we did some ground work. I then broke down my ride, identified when I started to get anxious. My nervousness started before I mounted. Anton did not stand still while I mounted, walking off before both my feet were in the stirrups. I would become nervous, Anton as a result becomes nervous and I am sitting on a horse that is planning his escape because the situation is getting out of control. For the next few weeks all I did was mount, dismount, slap the stirrup leathers on the saddle, flap the stirrup irons around and make as much noise as I could to try to desensitise the mounting process. I would bump his rump to imitate my foot or leg accidently hitting him as I mounted, if he walked off I would scold him and return him to where he should be, if he stood still I would praise him and make a real fuss, huge pats and a break. Over time he was looking more and more for the praise and I was seeing a positive change in Anton, I was able to mount and dismount without him moving a step. We then started to mount from other objects, a cavaletti, a bench seat and anything else that was available, the first time I mounted from the cavaletti I was so proud I think I smiled for days after, and even as I type this the smile returns to my face, it was an amazing moment. I then started to walk on with one foot out of the stirrup, then both feet out. I needed to feel that should Anton take a step or two after I had mounted that I did not over react and that we calmly came back to halt. I then needed to come to terms with the walk. He is a big horse. He takes big steps and I needed to let go, one of the contributors to Anton’s nervousness was my death grip, with my hands on the reins and my legs on the saddle, which translates to mountain lion or grizzly bear hiding in the trees – now we all now they don’t exist in Australia but my actions were telling Anton that I was not his leader and I was not in a position to protect him, therefore it was every horse for himself and he was out of here. I needed to work out how I let him know everything is OK.
Next I took a long hard look at me and a trip to the masseuse, I have been going to a remedial massage therapist on a regular basis for over 12 months now, we still have some areas to work on but the improvements have been outstanding, my muscles were so tight that it was physically impossible for me to relax, when my instructor would ask me to drop my shoulders, mentally I was doing it, physically they were unable to move. I can now lengthen my legs, and open my pelvis, I also have a relaxation mantra that I use even when I don’t feel nervous I still check in with my shoulders, my back, my pelvis, my legs, wiggle my toes and fingers, breathe in and sigh out. I was now starting to gain some confidence. Next I needed to become comfortable with this big trot, Anton would bound into the first steps of trot and I would think he was taking off, which was my initial reaction to all his forward movements. At home in the paddock we were becoming braver and the trot was getting bigger, but when we were out the trot was still pokey, my instructor wanted more in the trot, I would ask for trot with my legs but my body and mind were saying “no” I still had trust issues. Anton was gaining trust in me at a faster pace then I was in him. I wasn’t reading his body language very well and I was continually sending him mixed messages, his frustrations worried me as I again thought he would take off – mind you other than a couple of minor incidents after the Elcho Park fiasco he has not bolted, nor had I fallen, so my worries when you think about it rationally were unfounded, but who is thinking rationally when they are worried! I started to “let go” do a few strides of bigger trot, come back get myself together and then a few more strides, slowly but surely Anton was proving that he was not that scaredy horse anymore and slowly but surely I was showing I was not that scaredy rider. I still had a lot of body issues, I was a very unbalanced rider, my stirrup leathers told the story all too well, I had managed to stretch my right stirrup by several holes and my saddle continually slipped to the side, knowing this contributed to my fear of “if he takes off how will I stay on?” Slowly I have been improving here, I pay extra attention to my non dominant leg and put extra weight down into this heel and seat bone, it is now starting to feel like a normal body position, I check my stirrup length every ride and for the last 3 months they have stayed even woo hoo, progress!! I wanted to start doing some showing and I thought I was ready, so we spent hours getting ready, shampooing, plaiting, up til all hours getting ready, then up bright and early and away we go. The drive to the venue was in silence, I was so nervous I could not even put a conversation together, my husband would try to make small talk to take my mind off it but it didn’t work. I had cleaned all my riding gear and packed it all the night before, hoping and praying I would be able to compete. We didn’t consider doing the smartest on parade, new to showing we did not have all the flash gear so we waited for the led class, Anton was alert but calm, I just kept thinking, run fast, stay straight, please, please, please turn when we get to the corner, all the time wanting it to be over, doesn’t sound like I was doing something I loved, more like I was being punished. A couple of shows later we end up at a local HRCAV show, we had saddled up, a warm up of sorts and as I enter the ring I explain my circumstances to the official and the judge, explaining my nervousness in particular with canter, the official was very understanding, the judge not so much but they had allowed if I attempted canter when it was asked for but did not feel comfortable I could excuse myself from the class, well I got one stride of canter, I quickly came back to trot and quickly excused myself from the class. There were mixed emotions. Why couldn’t I canter? Anton did not do anything naughty or bad, in fact he was very well behaved. At the same time I had actually gone into the class, trotted with everyone, made an attempt at canter and survived. I felt really bad, like a huge failure. Really when you think about it, why did I think I would be able to canter at a show, in a group when I was still struggling to canter by myself, I hadn’t even cantered out in the open yet! Why hadn’t someone said to me “don’t waste your time going to the show, you’re not ready” Every time I mentioned to my instructor I was thinking of going to a show she was always excited and supportive, my husband always concerned but willing to come along and help. The next show comes around and just so happens to be at the same grounds, again I have prepared Anton beautifully, my gear is clean and whilst excited I am a little apprehensive about whether this is really what I want to do. As we enter the smartest on parade, I say to my husband, I don’t expect to place, I just want to finish the class. The weather was atrocious, the wind was blowing a gale, the class was huge, at least 20 riders, to say I was nervous was an understatement, the judge asks us to trot on, OMG!!!! Horses are bucking, spinning, bolting, riders have fallen, riders have jumped off and I am sitting on Anton patting his neck saying good boy, its OK! !, I look over to my husband hoping he will beckon me over, but he doesn’t, he gives me the thumbs up and my excuse to leave the class is gone just like that. The class is now down to 10 and the judge asks us to canter on. Are you kidding after what just happened?! Deep breathe and we canter, I mean really canter the whole way around, I think I am smiling, more horses buck, more riders come off and we are OK, amazed and OK. We line up and manage to get ourselves a 5th place; we leave the ring very proud of ourselves. We then do our led class and our rider class, again we manage to canter without incident, the judge points to us and calls us in, I am not sure if I was relieved to be called in or relieved to stop cantering in the group. 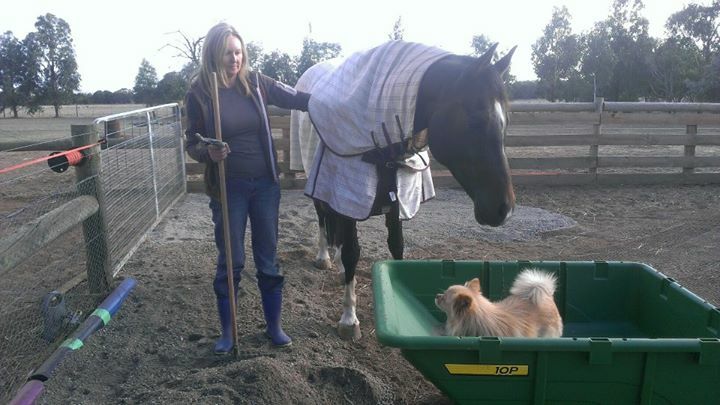 We do our work out, walk, trot, canter, Anton is working beautifully and I feel happy. We do not place (wrong canter lead on the left circle) but the day wasn’t about winning a ribbon, the day was about finally participating. The weather worsens and we decide to finish the day as winners. So so proud!! Oh and the reason no one said “don’t waste your time going to the show, you’re not ready” is because it was never a waste of time, each time I went out it got a little easier. We achieved another goal, however small we were moving forward. How fortunate I am to have people around me who never told me I wasn’t ready. Now back to the trot, it was getting better, bigger and I was feeling more at ease with it, in fact the more forward Anton was, the more comfortable it was, the softer he became and the easier it was to work on my position. I was starting to feel when I was unbalanced, when there wasn’t enough weight down through my heels, when my seat bones weren’t even, it felt like progress. I was able to get some lengthened strides and it felt great. It was still taking me a little while each lesson to build up to this forward movement, we would start off pokey, a little apprehensive, gradually building up to more forward, once we had it, it was awesome. Our confidence seemed to be contained to our lessons, I was relying on my instructor for security and reassurance that we were ok, I needed to have this same feeling on my own. I couldn’t put my instructor in my back pocket, at the ready for when I needed her, so the work began at home. I could not accept pokey trot anymore, it had to be forward all the time every time. So we started to push the boundaries at home, each ride I would ask for a little more, then a little bit more. Each ride I was getting more and more confident. Now for the test, could we get this forward in a lesson? Yes we could, and we did, what a great feeling to hear your instructor happy with your working trot, the extra work was paying off. Now could we do this outside the arena? After all we had to enter the arena from the outside in a dressage test. There was still a lot of apprehension out in the open, but hang on a minute…what was separating us from the open when we were in the arena? A couple of old telegraph poles. Anton could step over those without a blimp in his stride, so therefore we really were riding in the open. Ha, sounds easy when you rationalise it while you are off the horse, completely different when you are on his back. The telegraph poles provided a “safe” area in my mind, easy to push a little more each time while in the safety zone, outside on the grass was different, all manner of things could happen “out there”. It was important for me to ask for a little more each ride; I think my fear of slipping backwards into the rider crippled with fear scared me more than what might happen if I asked for more. To Anton’s credit he was so willing, if I asked correctly he quite happily answered, calm, sweet and so forgiving of my improving position. Funny, the horse that worried me and was so forward had become, at times, the lazy horse that now needed an extra squeeze, sometimes a kick and look out….. a tap with the whip! Truth be told, he hadn’t changed at all, I had. Where I was happy to take 75% less than what was offered, then 50% less than what was offered, then 25% less than what was offered I was now asking for 5% more, then 10% more. I was increasingly becoming more confident and received the greatest pleasure from each lesson and ride. I now felt good about the trot, and how’s this for irony, sometimes when we are doing forward trot, my instructor is asking if the rhythm is my trot or his. 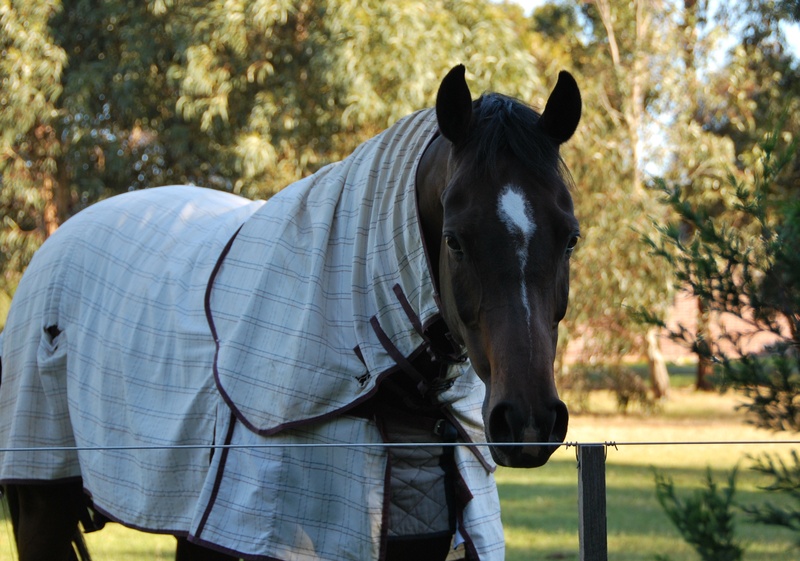 Throughout this time Anton’s demeanour at home was changing in leaps and bounds, he was happy to be around “his” people, he took comfort in our company and the snicker from the paddock when you approached just melted your heart. He would nuzzle into you for a pat and a cuddle and his eye was always on you. He had become very precious to the whole family. He would lower his head over the stable door so the little children could reach for a pat and cuddle. This was an amazing transformation from the horse that hated to be touched, did not want a pat and could not stand still. Time, patience and perseverance had triumphed. I had been setting many goals during this time which for me was a bitter sweet experience. 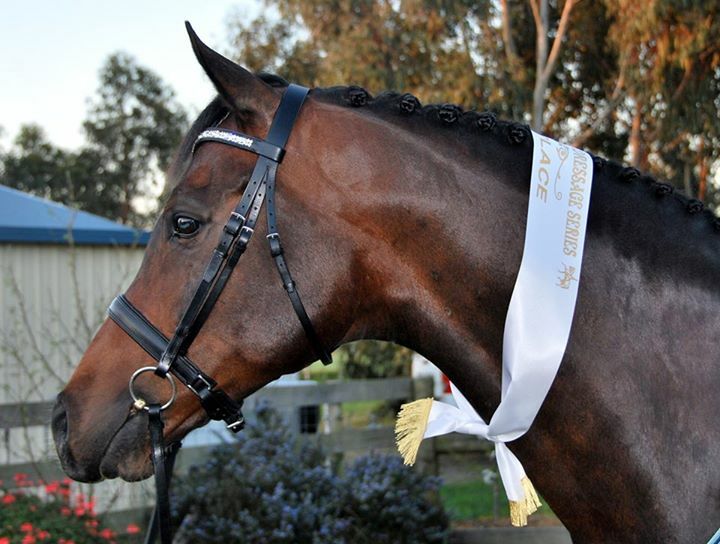 When I started having regular lessons 18 months or so ago I set a goal to compete at Barastoc and the Summer Royal Melbourne Show at Werribee, it seemed a reasonable goal at the time. After all it was 12 months away. The plan to achieving those goals kept changing, sometimes I needed more time spent in a particular area, sometimes it just took more time to “get it”, sometimes there was set backs, sometimes I just needed to walk away and try again tomorrow. Well Barastoc came and went without me and whilst I was disappointed I didn’t really feel ready to compete at such a high level, I was still happy with what I had achieved so far. At the time I set the goal I didn’t know how many challenges I would face, how hard it would be to ride balanced, how hard it would be to ride in the wind and rain, how hard it would be to set goals. Each time I set a small goal, which ultimately was guiding me towards my main goal I would experience anxiety attacks. Each time I posted an entry form off I would feel ill, I was putting additional pressure on myself to achieve these goals but at what cost? Again, time, patience and perseverance triumphed, each competition started to get a bit easier, I started to look forward to the day and get excited, we were actually becoming a competitive team, and it was fun, I mean really fun. 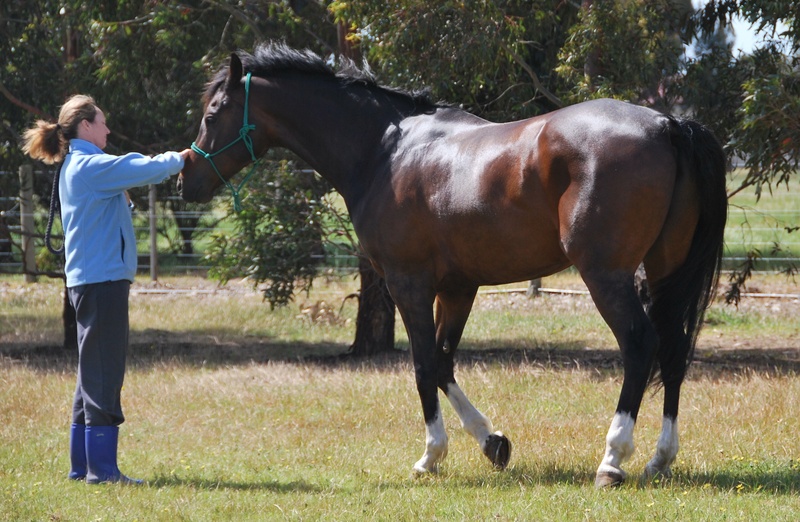 When most people hear someone say the “C word”, usually their first thought is a naughty word, well the “C word” for me is CANTER, the mere mention of the word conjures up all sorts of emotion and usually a replay of the day Anton took off with me at Elcho Park. The thought of canter would create a flood of tension through my body, every muscle tightened, I stopped breathing, my legs clamped around Anton like a vice and my hands took hold of the reins in a death grip, I didn’t stop to think what message I was sending Anton, in his world we’re riding around, a bit of walk, a bit of trot, bounce, bounce, oh yeah now she is fixing her position, oh she told me I’m a good boy, holy crap (another C word)…. where’s the bear, is it a tiger, a lion? Oh she wants canter. The first part of canter is CANT and so often I would think I can’t do it, I want to but I can’t. In our lesson I would get canter, oh and his canter is amazing so soft and comfortable, you would think I would want to canter all the time, but no, just the bare minimum thankyou. Every lesson, my instructor expected canter, even just one circle, I dreaded that part of the lesson so much. In the beginning I relied so heavily on her reading Anton and telling me everything was OK. Our canter was slow, and he would drop back to trot quite regularly and for me it was a relief, but as my riding improved and my confidence levels started to increase I realised the damage I was doing, I was teaching him that is was ok to go at his pace, not the pace I had asked for. Again, I was sending mixed messages and he would get annoyed with me. I would ask for canter, he would do a beautiful forward transition and I would shut him down. It’s easy to process it all in your mind and you know what you need to do but when it comes time to do it, as much as you want to you just cant. It is extremely frustrating and upsetting to want something so badly and to know that physically you are capable of it but the emotional barrier is preventing you from doing it. I needed to get over this, what did I need to do to make friends with canter? I recall talking to my instructor one day, in general, not about canter specifically but she mentioned that riders don’t do enough canter, the light came on, that was me, I was the one circle of canter per ride person. Now knowing that was not enough I spent the next few weeks at home doing more canter than I ever had, it was still slow canter, small circles, safe, but I was after quantity not quality, and slowly but surely the canter at home was good. This started to filter into my lessons, I was getting more comfortable with canter and the CAN at the start of the canter word seemed more appropriate now. We were now able to start improving the canter, improving my position, just improving, oh what joy!! Of course the next step is canter out in the open, again I was filled with dread, I can’t do it. I’m not really sure I want to do it. My caring instructor had arranged with one of her understanding students that had a very reliable, responsible mount to ride in the open with me, the ultimate goal for me to canter. We trotted many, many circles, and I recall my instructor saying “now sit up and canter” but we continued to trot, and then, its hard to explain but there was a moment where everything just felt right. I asked for the canter transition, it was amazing, absolutely amazing, we were cantering in the open, sweet controlled canter, yes, in the open, it is truly one of my ahhhhhh moments. So now you would think everything is ok, yep, walk, trot, canter, in the arena, in the open, perfect I am now a confident, independent rider. Sadly, not yet. Riding club rallies were still proving to be quite a challenge, I was not comfortable riding in a group, my biggest fear being that he may race off after the other horses. Why I thought this I have no idea because he has never done this before or even shown signs that he might. I picked my classes carefully at rally, preferring an enclosed arena, an instructor that I knew and was comfortable with. 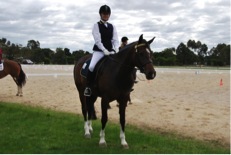 There was also the embarrassment of being known as the rider with the horse that bolted around Elcho park. Most people have good intentions when they give you advice about what you need to fix your “problem”, or suggesting that maybe your horse is too much for your riding level. It was becoming obvious to me that if I had confidence in the riders ability around me I had confidence in myself. One lesson after chatting to one of the club members it was revealed that she was quite an experienced rider returning to riding and her mount was a been there done everything type. During the lesson the instructor commented how beautifully she was riding, when we were asked to canter in the group there was never a thought that I couldn’t do it, we just did, I was reassured that she had control of her horse and her world and I only had to worry about my horse and my world. Our next lesson on the same day was a mix of inexperienced riders, inexperienced horses and a larger group than the one before, I was not comfortable in this group, and should something go wrong I was not convinced we would be safe, again the nerves were back and the thought of a group canter worried me. The frustrating thing about losing your confidence is that even when you start achieving huge milestones there is an expectation that you are fixed. This couldn’t be further from the truth. In some cases you place increasing pressure on yourself because you did it yesterday why can’t you do it today? Just recently I confessed to my instructor that I had not been able to canter in our warm ups before our dressage competitions, and the confession only came after I managed to overcome this fear and canter. So why didn’t I confess sooner? Why didn’t I seek out help to overcome this? After all when my instructor had met me at competitions such as TTT dressage I had been able to canter in a busy warm up arena and then go on to ride a nice test. If I could do it then why couldn’t I do it now? We would talk about what we needed to cover in our warm up and in my mind for each competition that’s what I was going to do, but when it was time to happen, it just didn’t happen. My first tests was always sub standard, and in reality so was my warm up. I was annoyed with myself that I was throwing away a good score on our first test and I knew it was because we were ill prepared. We were competing in the Golden Spurs series and we were in with a chance. I asked myself, “how bad do you want this”, you try to be gracious, winning isn’t everything, its all about the experience, etc, etc. For me I wanted to do the best I possibly could, if that meant first, great, if it meant second, great, if it meant last, great, but it meant I had to give it my best shot and throwing away the first test was no longer an option. This was the first time I had been really stern with myself. It is so easy to say “just do it” and Nike has a lot to answer for, but sometimes the time is right and you do have to “just do it”. At this particular competition Anton was more aware of his surroundings than he had been before and I was quite worried, I was seriously contemplating getting off and saying “I’m done”. It was getting closer to the time when I was on and I still couldn’t get Anton’s attention, lots of deep breaths, wiggle toes, wiggle fingers, and then just like magic, he was back, he was listening to me, he had relaxed, was it me? Was it him? It didn’t matter. We did lots of walk trot transitions, he was forward, he was soft and just like that we cantered, and it was amazing! There were other horses working around us and we were fine, we change rein and canter, no it wasn’t a fluke we managed to do it on both reins, I can not put into words the feeling of relief that we had done it. Canter is now the “CAN do” word. Does this mean I am a confident rider, yes, at times. Does this mean I will be able to canter in my warm up at the next competition, or walk, trot and canter out in the open any where, or canter in a group in any lesson? I like to think yes I am fixed now, but confidence issues and human nature doesn’t work that way. I like to think I have enough tools to work through my confidence challenges and as each ride goes by it continues to get easier, there will always be unknown circumstances that will continue to test me. My journey is not over, it is just beginning and as we get bigger and better so too will the challenges, I am sure my confidence will continue to be tested on a regular basis but I feel confident that we will succeed and have fun while we do it. As Walt Disney so famously quoted “if you can dream it, you can do it” This quote doesn’t give a time frame to do it in, it doesn’t give a budget to work with, it doesn’t give consequences if you don’t do it, it doesn’t say how you do it, it just says “if you dream it, you can do it”. As a young girl I always dreamed of owning a horse and of being a beautiful rider, nowhere in the dream did it show the amount of hard work and dedication that is required, or that there may be hurdles, road blocks and set backs!! I have no aspirations to be the best, but I do aspire to be better, better position, better transitions, better frame of mind, after each ride – just better. I now approach each ride with a happy, positive, contented frame of mind, as a result now at the end of each ride as I take the saddle off and give Anton a pat and hug I feel better. I also have an open mind that I may not achieve exactly what I planned to in my ride, but that we tried something new or that we continue to work on the things that are not quite right and sometimes the better is noticeable and sometimes the better is a feeling on the inside that is only shared between Anton and I. We now come to the final leg of the Golden Spurs series. After Colac we are leading the Level Four section which brings great excitement but also some added pressure. So in my mind I break it all down, I just need to keep riding consistently, I do not need to change anything, our plan is working. We managed to canter in our warm up last competition so we will be able to do it again right? We have a riding club rally the week before; great we can practice our tests there, we have a caller lined up; great no need to stress about forgetting the test. Everything on the outside is GREAT! So now here are the negative things that have slowly crept into my mind. Daylight savings has finished and I will need to ride under lights after work argh!! Inverleigh always has kangaroos on the grounds argh!! Inverleigh doesn’t have many yards argh!! These negatives are fantastic and I will tell you why. These negatives are not isolated to me or to Anton, they are not created by any catastrophic circumstance, they are negatives that other riders competing may be worrying about as well. My preparation for the competition is not great, two weeks out we have a week of rain, so very little riding, one week out I am struck down with the flu, enough energy to go from my bed to the toilet and back to bed. I make the decision not to ride and conserve my energy in anticipation of being well enough to ride on Easter Sunday. Saturday comes and I am still ill, all I want to do is cry, I can’t finish the series like this. I need one point to move into level three and achieve my goal. I ask my instructor “will it matter if Anton is not clean and plaited?” realising I don’t have the energy to brush him, let alone wash him. I just need enough energy to do a quick warm up and ride two tests. To my rescue comes Fiona, she gives Anton a ride on Saturday, gives him a wash, trims his tail, and plaits his mane, he looks super! My husband packs the car for me and everything is ready to go. I wake up the next morning a bit better, hopeful I will last the day. We arrive at the grounds, Anton is super cool and relaxed, the weather is fantastic, we find an empty yard and go to the office to hand in our cards, I feel good, we can do this. My husband tacks up Anton for me, I mount and everything feels good, we are both relaxed, the feeling is surreal, the calmest we have ever been, am I too sick to be nervous? We ride over to gear check and then start to warm up, still good, happy and relaxed, can you believe it we are cantering in our warm up, again and again, I am so relieved. I was worried it was going to be a once off and I would not have the nerve to do it again. It now comes time to ride our tests, we manage a nice straight entry and a reasonable halt, but things slowly deteriorate from there, the tests are good, not our best work but given the circumstances more than I could have hoped for. Now the waiting game, were the tests good enough to place and earn one point? Watching the other combinations I was slowly thinking maybe not, there were some really nice tests being ridden by the other riders. Should I miss out on a place today I would not be terribly disappointed, we had achieved so much this series. We head over to the presentation area and wait. I have placed 6th and 4th, hooray!!! I receive the one point I needed!!! Then to cap it all off we finish the series in first place, the perfect reward for all our hard work and dedication. This has been such a rewarding and satisfying journey and I have had amazing people come along with me, sharing my highs and lows. We have achieved this goal and are now a level three combination. I have learnt to manage my fears and anxieties, my confidence growing more each ride, I have been taught riding tools to help me work through difficult situations, I can rationally manage each ride and understand how important it is to make Anton feel secure, if he feels safe, I know in turn he will keep me safe. I have an instructor that allowed me to work through my confidence issues in a safe and encouraging environment, always helping me overcome mental and physical barriers with my riding. I have a family that supports and encourages me, joking with me at my inhibitions. I have a wonderful horse that is happy and healthy and tries his heart out every ride and is always forgiving of my riding as I continue to improve. All in all we have made great progress and I feel very proud of what we have achieved together, excited by what is to come in the future. Our flagship program #GetConfident is now open for enrolments. Designed to give you the tools to assess yourself, develop a clear plan, ride confidently and provide 6 months of ongoing support so you can achieve your riding goals.